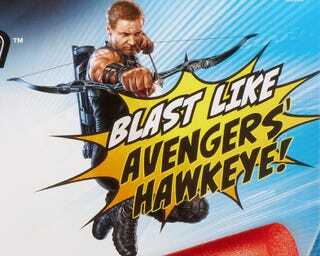 Captain America has his shield, Thor has his hammer, Black Widow has her thighs and Hawkeye has his awesome bow. We've seen very little of Jeremy Renner's superhero Clint Barton (better known as Hawkeye) from Joss Whedon's Avengers. But now you can get a better look at the man and his big bad bow, because Hasbro have given us the exclusive first look at their Nerf version of Hawkeye's bow (which includes a close up look at the weapon itself, in a production art snap). Offered for the first time in Hasbro's MARVEL line, kids can pretend to be THE AVENGERS' mighty archer with this bow! Based on the newest hero from the upcoming film THE AVENGERS, the HAWKEYE BIG BAD BOW features high-performance launching for three included darts, with space to store your extra arrows! The price tage is set at $24.99 and the instrument of war will be available in March of 2012.